oil on panel. 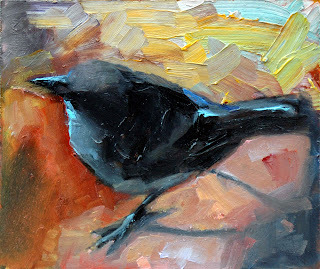 Juno is a little Scrub Jay that my husband Stock and I rescued our first day at camp, summer 2009 We had planned a month of plein air painting along the Trinity River in northern California. Stock did follow the plan to paint but I had to tend to the youngster, it was a six week commitment that truly changed our lives. In that time I produced many paintings of Juno. The love he brought to our hearts will never fade. Click Juno to view more paintings and photos.